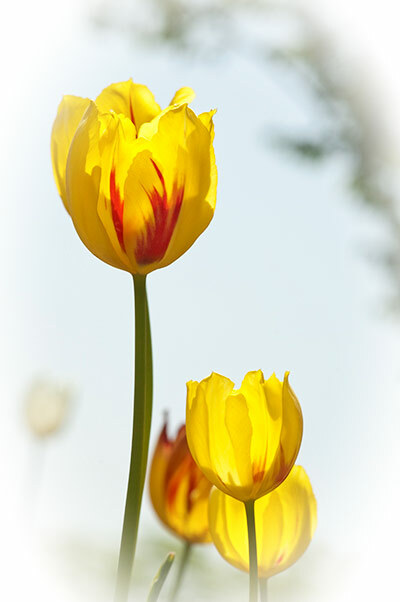 Pictures of tulips can be so dramatic that only the sweet scent is missing. 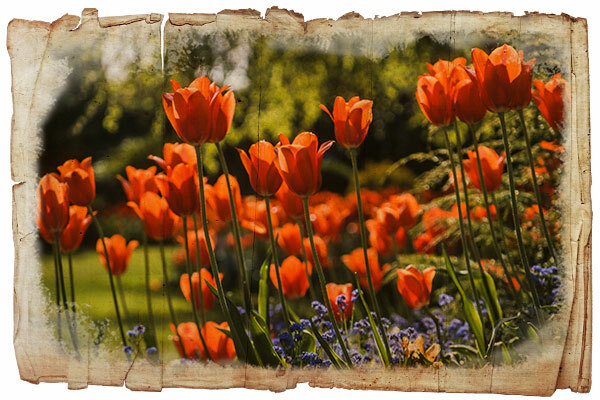 The colours in a tulip garden are so overwhelming, especially to photographers... where do you start? Spring, and the dramatic colour festival, is so fleeting, you have to grab it by the petals while you can. different than a rose. It doesn’t have to. It is different. And there’s room in the garden for every flower." Orange Darwinian tulips and blue forget-me-nots in Queen Elizabeth Park, Vancouver. I used photoshop to apply a layer of paper from an old book. 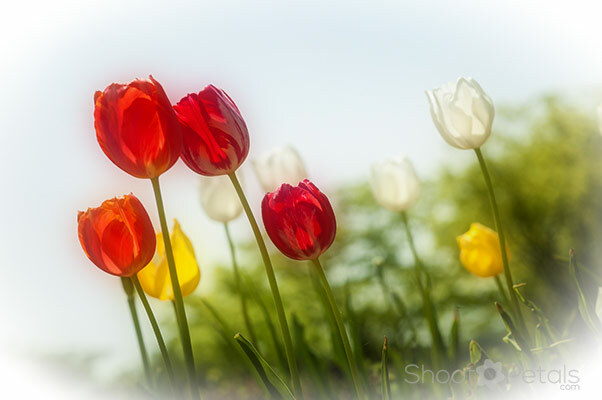 Get pictures of tulips as a total garden scene... a landscape. But "landscape" doesn't mean that the image has to be a horizontal image, like in the scene above. Make sure you get vertical shots of the same scene. Take in the entire view and see how the garden's been planned out. If you're like me, once you get into your macro lens, you'll be tempted to spend all your time peering though it...but drag yourself away for the bigger picture! Use a wide angle lens, maybe 35 mm or a 50 mm, and get lots of landscape views. Flower lovers flock to Queen Elizabeth Park in Vancouver. In the spring, it's a popular place. Spring bulbs bust out of the ground in February while Old Man Winter still has the rest of Canada screaming for mercy. Here's a landscape shot behind the conservatory. Soft sunshiny yellow lily flowered tulips. This is QE Park, just behind Bloedel Conservatory. 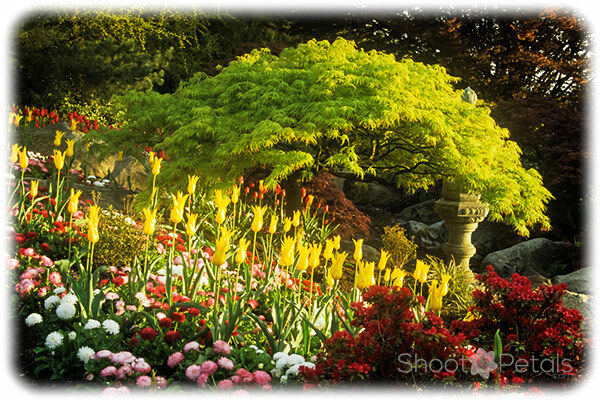 Shoot landscapes and not always just one or two flowers. Wait until later in the day when the sun isn't as strong, or when it's striking the plants from the side. This photo was taken in the evening and the light is rich and warm. In the golden light of evening, my pictures of tulips are brilliant. This is a photo with everything in focus. You won't see that in all the photos on this page. Sometimes you want one, or a few, flowers very sharp and everything else blurred to highlight the subject. Your photos reflect who you are. Be what you want to be. Even if you're a realist, you can have fun playing with a photo-editor. I don't process all of my photos in an artistic painterly style. Some I only apply basic adjustments in Camera Raw. But many of my photographs are impressionistic. 'Painting' my photos lets me play and express my own style in my photos. It makes my pictures unique to me. I use Lightroom, Photoshop, and Topaz Impression. I've also used ON1. Don't be afraid of editing programmes. You computer comes with one and if you outgrow that particular programme, move up to a more advanced software. Go through the lessons that come with your photo-editor or search YouTube for help. The point is to enjoy the process while you learn. ... cut your creativity loose! Glowing tulips after a rain. Most of my images have textures and layers added in my editing process. Photographers differ on their opinions about impressionistic photo editing. My only advice is to express yourself however you want to! If you work for a newspaper or submit to stock, then you don't have a choice.... you can't over edit your photos. They must be real rather than an artistic expression. Otherwise, put your imagination in gear and enjoy the editing process. You can apply vignettes right onto the original picture but that's NOT a good idea. Applying any treatment to the photo layer isn't a smart way to go. It destroys the original picture (pixels) and when you close the file and save it, that's final. If you decide you don't like it the next day (and who doesn't?) you're stuck with it! So get comfortable with layers... totally non-destructive. You can change your mind 1,000 times and your original file is happily unaffected. 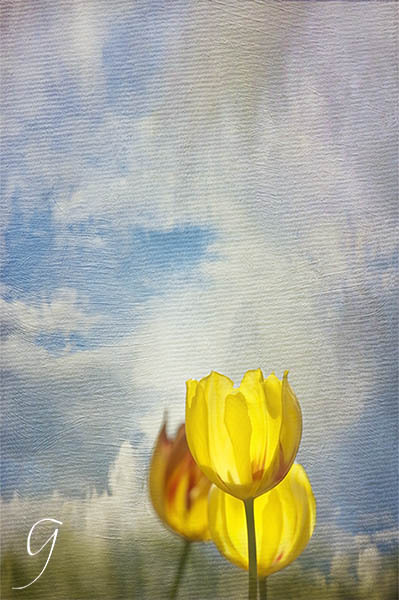 I could never have created this dreamy tulip image if I hadn't used layers. 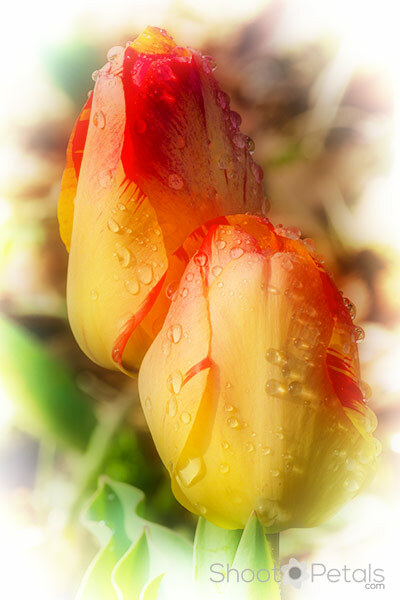 I put these dreamy, glowing tulips through Photoshop for minor tweaks, then I applied layers of white vignetting. At Daegu University in South Korea, one of my favourite photo gardens was between the Engineering buildings and the main administrative building. There's a small apple tree in the centre. The plaque says it was a graft from Newton's famed apple tree... remember the apple that landed on his head? I didn't get even one picture of that tree but... my collection of photos has hundreds of pictures of tulips, peonies and all sorts of spring and summer blooms. I'm thankful for all the hours these tulips were my models... all colours and shapes! I'm sorry that they dug out all the bulbs and planted bushes in their place. Backlit yellow and red tulips in South Korea. Edited in Photoshop with white vignette added. The same photo but with the large tulip masked out with a sky background layer. If you go to my photo composition page, Fibonacci and the Golden ratio you'll see this photo at the bottom of the page. In colour theory, red and yellow are primary, hot colours. So, these tulips have maximum sparkle! 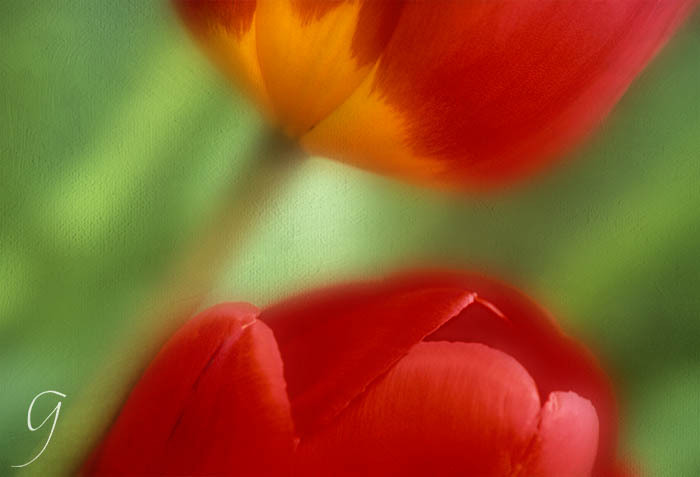 One of my favourite pictures of tulips from photography school days. These red and yellow Darwinian tulips were dazzling. I remember it had just rained and the whole garden was glowing. I decided to try a few abstract shots and this one was a keeper. Vibrant red and yellow tulips. Soft except for some petal edges. 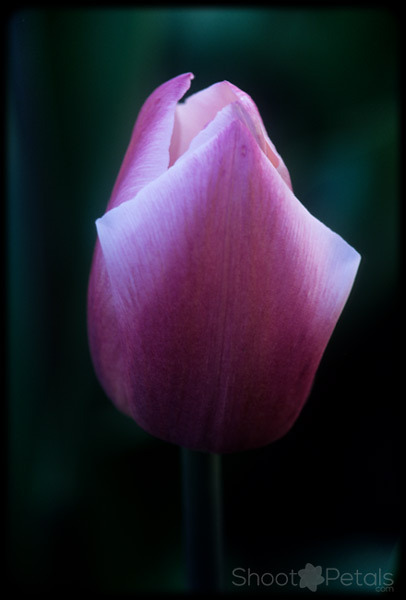 And this pink and white variegated tulip is another of my pictures of tulips from photography school days. The light falling on it is spectacular. The foliage and other flowers blur into a soft, dark background. Pink and white variegated Darwinian tulip. I used a shallow depth of field to put the focus on this beauty at Stanley Park, Vancouver. Since this tulip is in a garden and not a vase, the blue and green shades flow, rather than making a solid black. I totally love the colours... almost like blue-green flames. Filtering for shadows in Camera Raw or Lightroom would bring out the background and give much lighter, blues and greens. 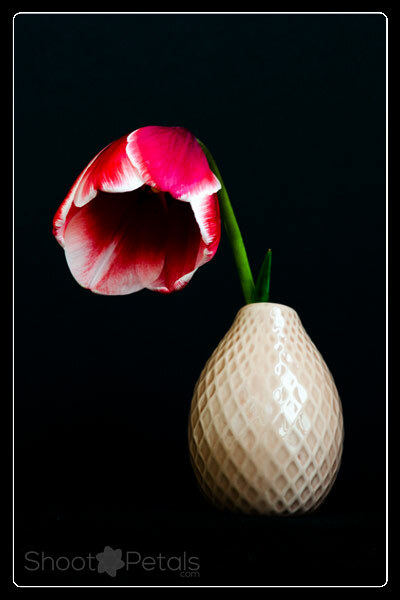 But the dark canvas highlights this sensational tulip and I love it! This is 35 mm. slide film, scanned on a Nikon Coolscan. I still really enjoy shooting with my Nikon film camera. I don't often use solid black backdrops but this photo turned out great. Shooting out in the garden is more my style. I don't have studio lights but that's not really a big problem with huge windows. Be careful with backdrops that they aren't shiny... you'll end up with horrible reflective spots in your photos. Make sure it's a flat matte and you're not shooting in strong, direct sunlight. This is the tiniest tulip I've ever seen. The vase is only 3 inches tall. I used a circular polarizer to bring out the intense red in the petals. And a black backdrop makes the tulip jump right out at you. I set this up on my glassed-in balcony and waited for the clouds to cover the sun. It's still a very contrasty image but that's the way it was meant to be. Doing indoor shots? You'll need a tripod. If you need help with setting up a simple home studio, here are some suggestions. Miniature red and white Darwinian tulip in a vase. An afternoon shoot in my apartment putting a bouquet to good use! The background is black fabric. Of course, the best place to be in the spring for exquisite pictures of tulips, is the Netherlands. I've been several times and not once has it been the height of tulip season. That trip is on my bucket list. Since I'm back in the BC, Canada area now, the Skagit Tulip Festival is not far across the US border. That is going to be an amazing day trip! You don't need acres of bulbs to get great pictures of tulips, though. They're popular garden bulbs and you can always buy a few at the flower shop and take some close up or macro photos. Always get a mixture of shots for your flower picture collections... horizontal and vertical as well as close up, macro and landscape. Please leave me a comment in the box below.I'd love to hear your stories, share your photos and read your comments about this page. I love my heron images from here on Vancouver Island. One particular pair of herons are always obliging models. They're relaxed and trusting while I photograph and talk to them. A histogram is easy to read with a bit of practice. An effective tool to help you get the picture you imagine. Yeomiji outdoor gardens delivers a French, Italian and Japanese garden along with several culturally significant Korean gardens. All Rights Reserved. Don't steal! If you wish to use a photo or story, please contact me in writing. will serve you as I am not familiar with you or your skill level.